Hosting providers will find offering monitoring as a great value-added service for their customers. Our WHMCS module allows you to offer your own branded monitoring using NodePing services. You can sell monitoring as a stand-alone service or as add-ons to your current services. You configure the monitoring, features, pricing any way you choose and can present it as your own. Our WHMCS module uses our API to seamlessly integrate the monitoring service into your WHMCS-enabled site. 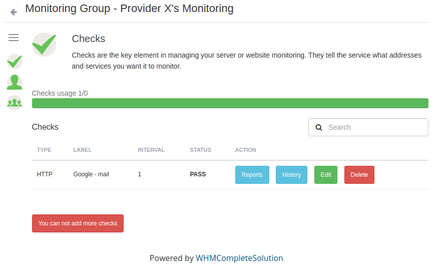 The WHMCS module is available for free to all 'Provider' accounts. Download the NodePing WHMCS module version 2018-10-17 and unzip it in your modules/servers directory. Follow the documentation for setup.